Summary Goodreads: Dolssa is a young gentlewoman with uncanny gifts, on the run from an obsessed friar determined to burn her as a heretic for the passion she refuses to tame. The Passion of Dolssa was a wonderful, enchanting read. The first ⅓ was somewhat confusing and hard for me to get into, but after that, I couldn’t put this book down (especially during the last 100 pages. I loved the characters so much, and the close friendship between Dolssa and Botille just made me so happy. Basically, this book starts with a historian recording the story of Bottile and Dolssa, with Bottile being the one to tell him the story/narrate it. Botille and her two sisters, Plazensa “Plazi” and Sazia, run a tavern in the small village of Bajas located in Provensa, which we now know as Provence, France. On a trip to retrieve two boys for an older woman from the village, Bottile finds Dolssa nearly dead on the side of the road. She and her sisters take Dolssa in and let her live at the tavern. However, Dolssa has recently been condemned a heretic by the church and is on the run from a bloodthirsty friar who is determined to burn her. Botille is a skilled matchmaker and has been matching together people in Bajas since she was thirteen. Along with her sisters, she runs a tavern while Jobau, Sazia’s father and an alcoholic, lazes around and does nothing. Bottile is very fierce and passionate but is also extremely kind and caring. I loved the relationship she had with her sisters and how close they were. Dolssa has recently been condemned a heretic by the church and is being hunted down by Friar Lucien to be burned at the stake. She has recently lost her mother, leaving her all alone, until she meets Bottile and the rest of the villagers in Bajas. Dolssa is pretty much in love with God and refers to him as her beloved and is able to heal people. Like Bottile, Dolssa is also very kind but in a different kind of way. She doesn’t hesitate to put others before herself, even if it means death. There were so many amazing side characters as well. I think Botille’s sisters Plazi an Sazia were my favorite. Those three really love each other, and you can just tell how much they have been through and how close it has made them. We also have the obsessed Friar Lucien who refuses to stop searching for Dolssa, even when he is given orders not to. I loved all the people of Bajas though, and they fit so well with each other to make close-knit community. Not only did I love the characters, but the setting as well. I’ve never read a book set in medieval times before. I have read ones where it’s inspired by medieval times, but never one during it. This book mainly takes place in 1241, with little snippets taking place afterwards (Botille telling the rest of her story and the person who was recording the story). Reading this was like being taken back in time. Julie Berry does a really great job with not only making you feel like you’re actually there in 1241, but also just in general with her writing. It’s not overly descriptive, and has just enough detail to paint a clear picture in your head and make the characters seem as if they could peel right off the page. It was enchanting, really. After reading this book, I definitely want to check out some of her other works mainly because she does such a good job painting a clear picture in your head with her beautiful writing. These voices from the past had arisen like ghosts demanding to be heard. The story overall was very dark, especially as you get closer to the end. I mean, it’s a story about a girl being hunted down in the middle ages, I wouldn’t expect it to be anything but dark. It was so much more than I thought it would be though. At first I didn’t think it was all that dark, but as it goes on, it just gets more and more so. It’s a very heavy book and definitely not something to read if you want something simple and light, because it’s the exact opposite. My favorite part though? The close friendship between Botille and Dolssa just felt so real. Both of them have been through so much, alone and together, it brings them very close. When people mention strong female friendships in books, this is exactly what I think of. Dolssa is so selfless and would do anything, and I mean anything, to protect her best friend Bottile and her family. Bottile just can’t bear leaving Dolssa, and it just made their relationship even more real seeing that close bond. So the reason I gave it four stars? Like I said, I had a hard time getting into it at first and was really confused. I even thought of DNFing it and trying it again later, but it really picked up once you get like 35-40% in. From there, so much begins to happen it’s impossible to get your mind off the story. 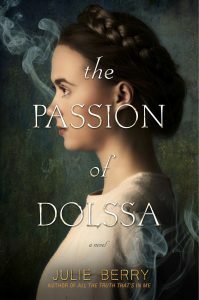 Overall, The Passion of Dolssa is a very compelling and dark read yet so wonderful at the same time. The friendships felt real and the characters were written so well it was as if they were real people. Also, the setting and writing were amazing. Four out of five stars just because the beginning was slow, but other than that, I loved this book! I totally agree. I for one have never read anything even somewhat similar. Believable friendships in books are my absolute favorite and definitely are not conveyed enough in YA at least. I hope you have a chance to read this and enjoy it (I’m not gonna spoil anything about the ending 😉 )!